It was “a secret service nightmare,” a disturbed aide of Maine Senator Edmund Muskie said referring to a walk-out demonstration that turned spontaneously into a sit-in which blocked the route of the Vice-Presidential motorcade. Obviously shaken by the amount of opposition expressed toward himself and Humphrey, Muskie put aside a prepared speech and called for a question and answer session with the dissenting students. Lee Elbinger, an Oakland student recently returned from Vietnam, stated that he had seen “all the blood and carnage” resulting from the continued American escalation of the war, and asked Muskie how the American people could be sure that a Humphrey administration wouldn’t pursue the same bankrupt Vietnam policies as the present administration. The harried politician responded in a typical fashion—avoiding the issue entirely and then attempting to make the question appear to be of concern only to misguided idealists. He said he hoped the people would have confidence in him and that he would strive for peace. “I can’t give you any guarantee as to the future” Muskie said. “I’m not going to promise you any pie in the sky.” It was clear from his words that neither himself nor Humphreak could make any commitment to ending the war. The Vietnam war is a natural outgrowth of American capitalism, of its systematic repression of political and racial minorities at home and of its policies of corporate imperialism abroad. A change in personalities will not bring with it a change in political outlook. When Muskie tried his new tactic of giving opponents 10 minutes to speak their views, Norman Harper, Editor of the Oakland Observer, stepped to the microphone and asked for ten minutes of “silent reflection” on the war in Vietnam and on the revolution in the black community. Apparently reluctant to relinquish control in this fashion, Muskie continued to speak but was interrupted when approximately 200 students, members of the newly formed Oakland SDS and their supporters, rose and walked out of the gymnasium in protest. Once outside about 100 of the protesters sat down in the middle of both lanes of a divided roadway, blocking the route of Muskie’s motorcade. Oakland County sheriff’s deputies were standing by in force, but the spontaneous demonstration broke up after about 15 minutes. No arrests were made. 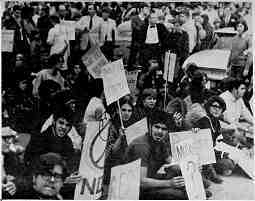 Later that night at Cobo Hall in downtown Detroit, a group of about 50 peace demonstrators picketed Muskie’s speech to an AFL-CIO convention. A brief scuffle occurred when a group of counter-demonstrators from the right-wing organization Breakthrough seized a black and white Resistance flag and burned it on the sidewalk in front of the building. Fifth Estate photo editor Mike Tyre, who was taking pictures of the incident, was rushed by two Breakthrough goons who grabbed at his camera and stole the flash attachment. Despite police claims that they were there to protect the demonstrators from the Breakthrough thugs it is clear what their role actually was. Detroit police are the same as police in Chicago or any other American city. They act only—to protect the property of the establishment and those with a vested interest in maintaining the status quo. At Cobo Hall, Detroit police let Breakthrough do their dirty work for them. When those who were attacked moved to defend themselves, a- squad of cops with riot sticks suddenly appeared to protect the attackers. And when Tyre and some other members of the Fifth Estate staff moved to get the stolen property back from the two thieves, the police prevented them from doing so, and refused to do anything further about the robbery which took place right under their noses. The demonstration continued with no further incidents and broke up approximately two hours later after Muskie had finished speaking, leaving—The Detroit Police and their friends from Breakthrough standing alone in front of Cobo Hall.